Hydrate and protect with the Crabtree & Evelyn La Source Nail & Cuticle Therapy; a restorative cream that promotes healthy-looking nails and cuticles without greasy residue. Harnessing the powers of Red Sea Algae and antioxidant-rich Green Seaweed, the luxurious treatment nourishes and protects against breakage and environmental aggressors, whilst softening dry, flaking cuticles to leave them perfectly pampered. Shea Butter and Glycerine deliver intense moisture and encourage natural, healthy nail growth. 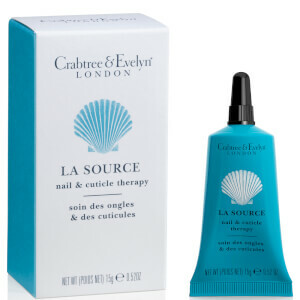 Apply to nails and cuticles morning and night for best result. Water (Aqua)(Eau). Glycerin. Cetearyl Alcohol. Isopropyl Myristate. Butyrospermum Parkii (Shea) Butter. Stearic Acid. Caprylic/Capric Triglyceride. Caprylyl Methicone. Polysorbate 60. Sucrose Stearate. Dimethicone. Cetyl Alcohol. Pikea Robusta Extract. Enteromorpha Compressa Extract. Commiphora Myrrha Resin Extract. Sucrose Tristearate. Arginine. Panthenol. Behentrimonium Methosulfate. Propanediol. Bisabolol. Fragrance (Parfum). Decylene Glycol. Allantoin. 1,2-Hexanediol. Polysorbate 20. Disodium Edta. Sodium Pca. Sodium Lactate. Aspartic Acid. Pca. Glycine. Alanine. Serine. Valine. Threonine. Isoleucine. Proline. Phenylalanine. Histidine. Benzyl Salicylate. Limonene. Eugenol. Linalool. Hydroxycitronellal. Butylphenyl Methylpropional. Geraniol. Phenoxyethanol. Potassium Sorbate. Sodium Benzoate.